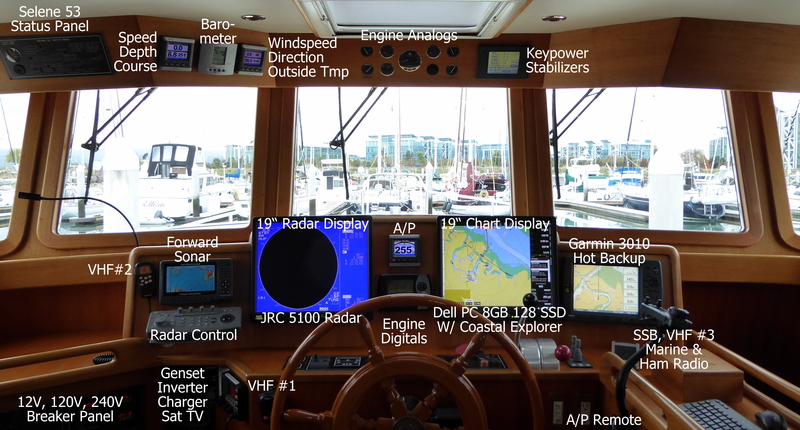 The route today takes us 40 miles to Bottleneck Bay, a cozy secure anchorage on the Inside Passage. There is slight open sea exposure at Milbanke Sound, but usually no worry if the typical west winds are in effect. It was an uneventful cruise and we arrived at 3PM. 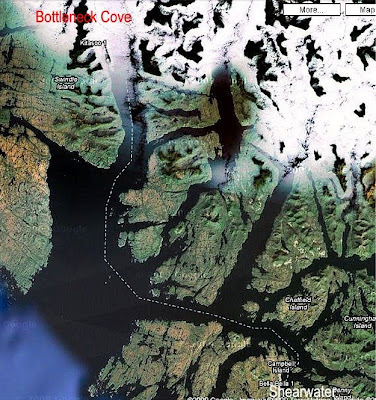 Our route to Bottleneck Bay on BC's cetral coast. Just as we tuend the corner to leave Shearwater a large Canadian Coast Guard buoy tender dropped it's anchor near us. 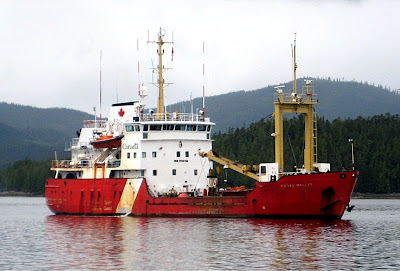 Canadian Coast Guard Buoy Tender near Shearwater. The entrance to the Bay is skinny but deep. 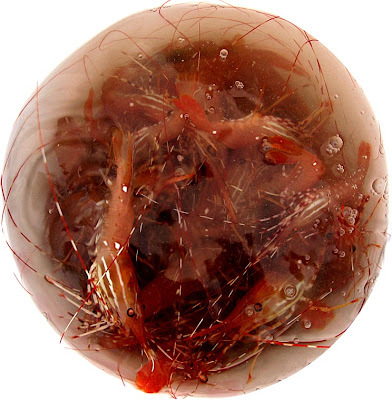 We dropped our prawn trap after adding a second can of Friskies, just outside Bottleneck in 190 feet. We'll pick it up in the morning on the way out. Skinny Bottleneck Bay entrance and location of prawn trap placement. 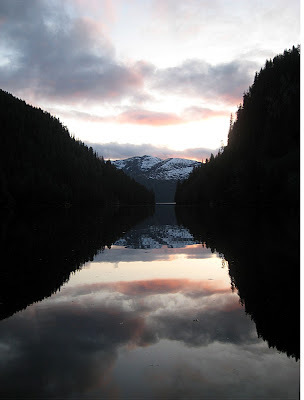 Sunset from inside quiet Bottleneck Bay. Wiggly fish basking in underwater light rays and waiting for biologist to assess. 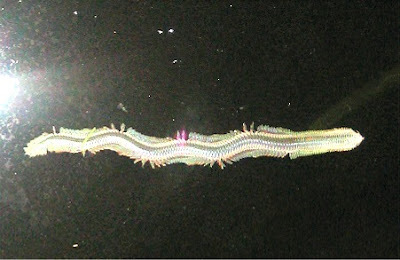 Bottleneck Bay is full of these critters. 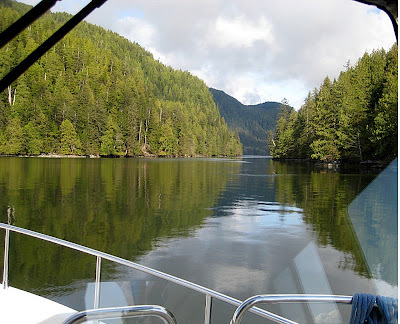 After a restful night in this peaceful, picturesque bay, we left early for Hartley Bay, with stops in Butedale and the grave of the Queen of the North. 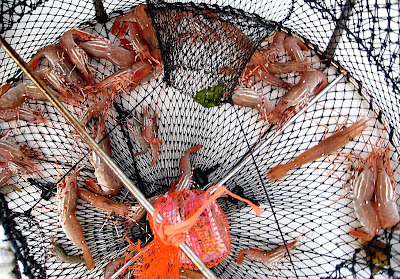 On the way we pulled the prawn trap set last night and collected about 30 good-sized spot prawns. Prawns in trap at 5:30AM pulling. Fresh prawns ready for deheading and the pot!